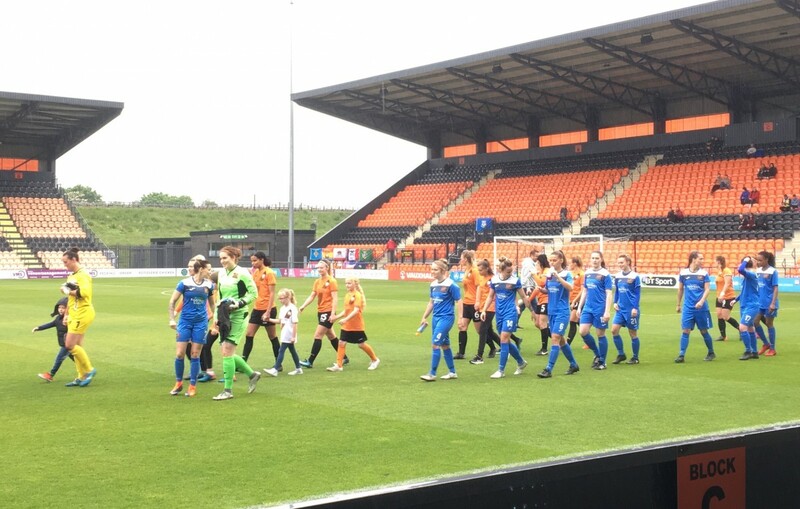 London Bees: Hobbs, Weston, Toussaint, Lea, Lane, Wilkinson, Clarke (O’Leary, min. 55), Howells, Rolandsen, Beckett (c), Will (Anderson, min. 79). Sheffield: Gibbons, Jackson, McCue, Dear, Gilliatt (c), M. Johnson, Cain, Anderson (E. Johnson, min. 58), Dixon (Lord-Mears, min. 72), Cashin, Kemp. INCIDENTS: WSL 2 match between London Bees and Sheffield held at the Hive, London. On a wet afternoon in London neithe London Bees nor Sheffield could find the magic touch to claim maximum points. Looking to start brightly, the Bees had two quick-fire looks at goal in the opening moments, a snapshot from Katie Wilkinson blocked into Evie Clarke’s path. Taking aim from inside the box, the young attacker drew a fine diving save from Danielle Gibbons before the visitors mounted their own attack. Evenly matched for the most part, the two took turns to attack, sending the ball from one end to the other without much luck getting past the last line of defence. A driven effort from distance from Emma Beckett saw Gibbons called into action again, grabbing hold of the slick ball at the second time of asking. Despite being the in-form team in front of goal in WSL 2 coming into the match, the visitors struggled to find their spark in cut through the home defence and test Nicola Hobbs. The ball sent back towards Gibbons before Sheffield broke forward again, the ball inevitably bouncing back towards the away goal before being sent towards the home one. Sheffield’s first real sight of goal came half an hour in when Niamh Cashin rose well to meet Jenna Dear’s floated free kick at the back post, her header wide of the target. Searching for rhythm in a juddery game, the side from Yorkshire began to threaten more and more. A deft chipped ball forward saw Hannah Cain released down the left, the attacker feeding the ball into Melissa Johnson only to see it double-blocked out to Katie Anderson. With both blue and orange flooding the box and slim route through to goal for Anderson, she could only pull the shot wide of Hobbs’ near post. Invariably, the Sheffield attack lead to one from the home side, numbers in the box continuing to thwart any good chances. With the rain falling intermittently, the match saw its best chance three minutes before the break, Paula Howells whipped cross sent to the back post, Wilkinson’s plumb header expertly turned clear by Gibbons. The break brought about little change in London, a chance a few seconds in for the Bees was following by a flurry for the visitors. Deft footwork from Cain enough to see her past three markers before Merrick Will stopped her in front of the box, the move followed by a rasping save from Hobbs to deny a low effort from Dixon. A flowing move saw the ball eased down the left flank, from Cain’s backheel to Melissa Johnson’s flick to find Ellie Gilliatt, all the move needed was a finish. Slipping away from its intended target, the ball skipped to the far side of the box, an unmarked Dixon the one to send the ball wide of the near post with Hobbs pulled out of position. Drifting out of the game, the hosts were given the opportunity to reset at a free kick, Beckett’s direct effort from 40-yards enough to sting Gibbons’ gloves without troubling the ‘keeper. Still in the away half, the Bees then saw a shot cleared just in front of the line, the ball refusing to drop in their favour before they were pinned back. With Sheffield unable to take the chances that fell their way they work diligently at thwarting their hosts. Orange shirts rushed forward as blue got back, one block, two, three, four then five in the space of seconds as not one player could dig a clean shot out, a subsequent Wilkinson header sent wide. The game ticked into the last quarter hour and once again Sheffield came agonisingly close, neither Melissa Johnson or Cain enough to turn the ball home with the waiting net desperately left empty. The players soaked to the bone, left to slip and slide across the sodden surface, continued to the last, looking for a spark to ignite them, the persistent rain doing enough to dampen any fire. A late chance fell to the hosts, Beckett’s low effort skipping up over the turf to, predictably, slide wide, little more than a handful of minutes left on the clock. Still refusing to give up, the game still saw chances, a neat header from Cain at a corner angled towards the top right corner but claimed by Hobbs. The chance met with another at the other end as the visitors gave the Bees too much time, the away defence scrappy, Rebecca Anderson’s drive turned around by Gibbons, the resulting corner another almost moment. From the first minute to the last, the two remained deadlocked, little to sperate them in the table, little to sperate them on the pitch.